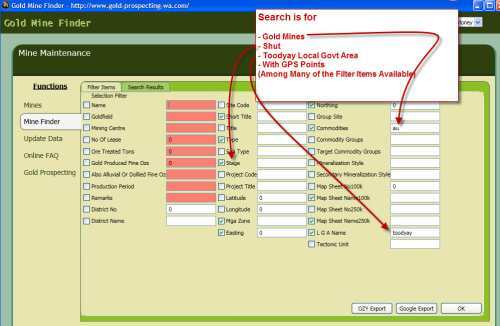 The Goldmine Finder Software and Data for over 34000 mines in West Australia is now available on CD with all the prerequisite programmes to enable you to download it and use it on your PC or Laptop. The standalone Goldmine Finder Software and database has been working flawlessly for some 6 years on PCs but suddenly early October the Tabs within the software are no longer clickable. We suspect it was caused through a Window 10 upgrade but have our programmers looking at the problem and the fix. Until the program is fixed we have temporarily removed it from sale.
" OZIexport" or "Google Export" not clickable. We are working on the fix and will send out an email to you with the fix as soon as the programmer has identified it and developed a fix. Until them we sincerely apologise for the issue and will place it back on the market as soon as possible. (Important Note ; We are currently rebuilding the Goldmine Finder Software and Data CD so currently it is not available until that rewrite is completed - that is estimated to be October 2018) - Not sure at this stage whether enough people are interested in a rebuild given the information on GeoMap and Tengraph Web! Contact us if you need to know more. We have temporarily suspended the Paypal Purchase button until the software has had a program fix implemented. In the past although you could find old gold mine names and mud maps showing you the way to the gold you did not have precise GPS localities. Over the last century those old map marks and tracks no longer exist - you need precise GPS points of the old gold mine to find it again. 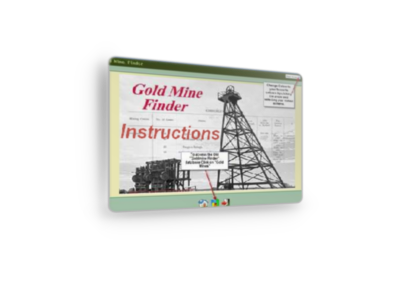 The Goldmine Finder database enables you to find the GPS points of old gold mine and then export them to OziExplorer and Google Earth Maps so you can find your way to the old mine. (Important Note ; We are currently rebuilding the Software and Data CD so currently it is not available until that rewrite is completed - that is estimated to be October 2018) - Not sure at this stage whether enough people are interested in a rebuild given the information on GeoMap and Tengraph Web! This software has now been released as a CD that has the Goldmine Finder software, data and all of the prerequisite programmes to enable it to be uploaded to your PC (and your Laptop if you want to), easily. Formerly the software was available as a download from the site but it has been removed for a complete rewrite to overcome some issues people had in downloading the programme for use on their own PC. NOTE - The software was not written for a MAC/APPLE/LINUX Computer, Sorry. Locate over 34000 Mines and their GPS Localities. It provides production figures for the Cancelled Gold Mining Leases, including whether the gold was Mined or Alluvial. You are only limited by your imagination what you do with it. PLEASE NOTE - The reference ebook will take a few minutes to load because it includes a lot of Graphics - Please be patient. Here is a list of the table of Contents. Chapter 1 - Introduction to the software. Chapter 2 - How to Access the Standalone CD Version of Goldmine Finder and Use it on your Computer. Chapter 3 - Goldmine Finder Explained in Pictures. Chapter 4 - Datafields and Explanations. Chapter 5 - How to Search for Old Gold Mines. Chapter 6 - How to Export GPS points to Oziexplorer. Chapter 7 - How to Export GPS points to (Free) Google Earth. Chapter 8 - The Easy Way to Apply for A Section 20a Permit. Here is a video of how to use the software and data to do research to find gold bearing areas. Disclaimer - This example is just a means how to use your ability to research and shows you one method of how to find some prospective Geological targets based on information that you find from other sources. It is not giving you the right to prospect in this area or suggesting you should go to the area discussed - you need to refer to Tengraph and find out the current ownership of the mining tenements before you access any land. Here is a picture of the Filter Screen and resultant search return - the whole process only takes a few seconds to select your filter items and retrieve the data. Sign up to the e-gold newsletter in the form below, for any upgrades to the Software and Data and Case studies on how it is used effectively to find gold prospects.